How to Pitch a Tent | GetOut! Prepare before heading out. If you borrow a tent or buy a new one, set it up at home first. “The last thing you want is it to be 11:30 at night and you don’t know where the tent poles go,” says Cara Varney, store manager at The Outdoor Source in Columbus. This is even more true if you’re pitching your tent in a rainstorm. Take an inventory to make sure you have all tent components and all camping gear. Location, location … you get the idea. The art of tent camping starts with smart site selection. If you’re in a campground, this is fairly straightforward. Cara has a hard and fast policy: “Look up, look down, look all around.” Look up in order to avoid camping under widowmakers, like broken branches, rotten trees, rocks or big piles of snow. Look down to make sure you’re camping in an established area, you’re not pitching your tent on sharp objects and that you’re not in a depression that can potentially fill up with water. By camping in a spot where others already have, you lessen the environmental impact of your stay. Looking all around also helps you avoid other hazards like bee hives and poison ivy. If you’re in the backcountry, make sure you’re close to a water source and that you have a place to hang your food bags. Finally, choose a flat spot, and if you can’t avoid an incline, make sure your head will be leaning uphill. The answer is blowing in the wind. In windy conditions, Cara says, “You want to face the skinny end of your tent into the wind, or a corner to the wind if you can.” This helps keep your tent from shifting and noisily flapping all night, robbing you of sound sleep. Be sure to stake the tent, pounding in the stakes at a 45 degree angle away from the tent. Here comes the sun. “In cooler temps I always try to have (the door and my head) facing east,” says Cara. This helps to warm you up on chilly mornings and the brightness will help wake you in time to go bird watching or get an early start on the trail. Here comes the rain. Pack your tent so that the fly is the first thing you access and, if it’s raining when you pitch it, pitch the tent under the fly as best you can. Your tarp or tent footprint should be the exact dimensions as the floor of your tent; make sure it does not stick out, because if it does, it will direct rainwater under the tent. Snug as a bug in a … tent. The rain fly will help keep heat in the tent, so use it when the weather’s cold even if it doesn’t rain. Having to get out of the tent in the cold night to pee will cool the tent interior, so go to the bathroom before turning in. If it’s hot, avoid using the fly. If there’s a chance of rain, connect the fly on one side of the tent and roll it in a way that you can jump out and quickly secure it when you feel a drop. Keep organized. Pre-trip organizing should actually start at the end of your previous camping trip. By making sure your equipment is dry, clean and fully functional after you’re done, you’ll be ready to roll for your next outing. 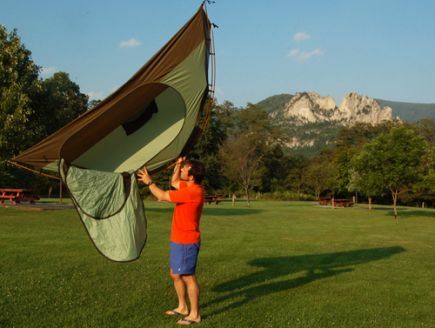 Using a tarp instead of a tent can be tricky with the poor weather and abundant bugs typical to the Ohio Valley. But you can try bringing only a tarp and parachute cord. Tie the tarp taught between trees, with one end high enough off the ground that you can sit upright; tie the other end close to the ground; the low end should be facing the prevailing winds, usually west. You can also hang it with the ridge line right down the middle or set off to the side so there is a short wall and a full-length wall. You can buy the 3 pound, 5 ounce MSR Vistawing for $180.